Hey everyone. I stopped by to pass along a non-Auburn piece of information. I'm planning to work on some Auburn-related stuff later in the days, so check back this afternoon for that. I passed along some comments from Pat Dye on the blog yesterday. Here is the full column I wrote for Saturday's editions. I watched basketball signee Frankie Sullivan play twice during the past week. He's in his sixth season as a varsity guy for R.C. Hatch High and is aiming for a fifth state championship. Isn't that nuts? I watched the Pickens game with Auburn assistant coach Brandon Johnson, who was there to show support or whatever college assistants do when they go to see their signees. He acknowledged that Sullivan, who is 6-foot-1 has the body of a point guard but a skill set that ideally works better at shooting guard. Not that Johnson cares. He said teams these days don't necessarily need a ball-handling specialist at point guard. He cited Florida as an example of a team that succeeds without a true point guard. Do you buy it? They sure do. We are very excited about Frankie Sullivan Frankie brings a lot of different things to the table. One thing that he brings is athleticism. He brings the ability to score in the backcourt. He can shoot it and get to the rim. He has gotten stronger. The one great thing I like about him is that he's a winner. He is used to winning and used to playing in big games. He has some leadership qualities that I like. He can play (point) and he can play (shooting guard) for us. I'm really excited about the season he's having. He has to do a lot for his team. I have yet to see him have a bad night when I watched him play. He finds a way to help his team in any way and that is the sign of a good player. I'd like to see him be able to play -- because of his size defensively -- a scoring point for us. He'll also have a chance to play at (shooting guard) because of his ability to shoot." I concur with most of Lebo's assessments. Sullivan, though, will need some serious work on defensive positioning and shot selection. With that said, the kid is a scorer, a very intuitive passer and someone who has the moxie you'd expect from a big-time prospect. OK. So you know I'm a Guitar Hero buff. Our friends who play GH3 on Wii have been bitter for months now because the game only plays in mono. Bummer. After months of dodgy behavior from Activision regarding this issue, the company dropped a mea culpa yesterday. 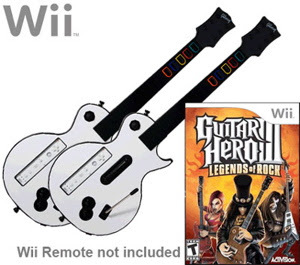 We are committed to providing our customers with quality game experiences and apologize for any audio output issues you may have experienced with the Wii version of Guitar Hero® III: Legends of Rock. Activision has worked with Nintendo to re-master the game and provide a replacement disc to consumers with Dolby digital surround sound and other consumers experiencing audio issues. If you wish to receive a full refund on your purchase price instead of a replacement disc, please click here and download the refund form, which outlines our refund requirements. So you can either get a new disc that will play the game in Dolby surround or just trade the game in for full credit. Hey, that's somewhat ballsy. I give Activision credit for that one. *In a somewhat related note, my lovely wife snagged a box full o' Rock Band yesterday at Target. It was on sale for $149. That's a lot better than the $189 price at launch. So I'll be knocking out some RB this weekend. I'll be getting some downloadable content, too, from Rush and Metallica. When I was a kid, man, I soooo wanted to be Lars Ulrich playing anything from ...And Justice For All. Now I get to live the dream. Sort of. Hey everyone. 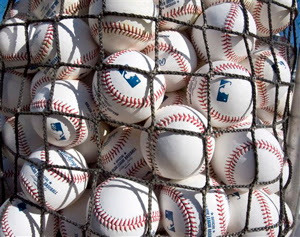 We've got a few things poppin' today, so let's get to business. I'll be covering the R.C. Hatch regional final game tonight. That game features Auburn signee Frankie Sullivan, whom I profiled in the blog a few days ago. I asked Jeff Lebo about Sullivan today. I'll get those comments posted a little later in the day. Also, I ran my baseball season preview in this morning's print editions. Check that out if you get a chance. There are so many kids on that team from the tri-country area. That group includes several starters: catcher Ryan Jenkins (Stanhope Elmore), second baseman Joe Sanders (Stanhope Elmore), closer Evan Crawford (Prattville), starting pitchers Taylor Thompson (St. James) and Cory Luckie (Prattville). I had a nice chat with former football coach Pat Dye today, who was in town for a Lions Club function. I know his segments on Paul Finebaum's show don't always put Dye in the most knowledgeable (lucid?) light, but he's totally normal when I talk football with him. I'm writing a column for tomorrow's paper about his thoughts on Auburn's recruiting haul. Here are a few other snippets you might find interesting. I'll be adding more as the day progresses. **On Alabama's recruiting haul: "Alabama had the perfect recruiting scenario this season: New staff, new enthusiasm, fans are excited, low numbers. The kids can go in there and play as freshman and that's what they want to hear. There's a lot of tradition and money there." **On the possibility of Auburn winning a seventh consecutive game against Alabama in November: "Based on what I know, Auburn should win again this year. They still have more numbers and more good football players at Auburn right now." 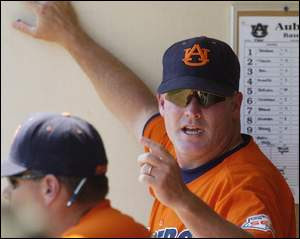 **On what he calls the `cycle of college coaching': ``It all goes in cycles and Tommy is at the end of his current cycle. They go about 10 years. The press gets tired of them, so people get tired of them. It's getting time for him to cycle down. Then it'll be time for him to cycle up again." **I then asked him about how Joe Paterno and Bobby Bowden made it way past 10 years: ``They had their down cycles, too. There was a time just a few years ago when Penn State wasn't any good. Do you think Florida State is any good? Paterno and (Bowden) -- they're at the mercy of their coaching staff. They don't have any influence on their players." **Then I asked about Paul Bryant, who obviously thrived through several cycles. Dye coached under Bryant from 1965-73: ``In 1969 and 1970, we were awful. We couldn't beat a good football team. He told us, the staff, that he wasn't going to put up with losing. He said he'd go to the NFL and we'd all be out of jobs. That put the staff back to work. Then the cycle kicked back up and we started winning again." Alabama was 12-10-1 in 1969 and 1970 combined. Alabama was 32-4 during the next three seasons. Dye left for East Carolina in 1974. Hey everyone. I'm working on the big BASEBALL PREVIEW that will run in Friday's editions. Since space always is limited in the newspaper product, I thought this fine blog would be an ideal place to run what I believe will be the team's opening-day lineup. Other SPs -- You're looking at Taylor Thompson, Austin Hubbard, Scott Shuman and Cory Luckie. Hey everyone. I finally had a chance to see signee Frankie Sullivan play ball today and, well, he is a stud. Check out my official HABOTN scouting report below. Also, noted scheduling ace Tommy Tuberville shifted his spring schedule around again today. You can peep the revised schedule below. I think spring practices will be closed to the public, though I'll be planning to give you all pretty thorough coverage. Thanks for perusing the HOTTEST Auburn blog on the 'net. Scouting report: Calm player. Not a take-charge kind of scorer who demands the ball. He fits in with what's going on around him. Outstanding passer. He anticipates his teammates' movements and makes passes rarely seen from high-school players. Undisciplined shot selection could hamper scoring production against better opponents, though his mechanics are fine. Finishes well around the basket. He doesn't look as comfortable dribbling, though he changes pace frequently. He knows how to throw a defender off. He has a real presence on the court -- frequently talking with his teammates about ways to attack the defense. His defense was difficult to gauge today. He was the middle guy in a 1-3-1 scheme. Sullivan jumps quickly. He's able to apply that offensive anticipation to defense by stripping passes and blocking shots. Strengths: Scoring, passing, emotional control, changing pace with dribbles. Weaknesses: Shot selection, defensive intensity wasn't remarkable. Summary: Reminds me of a more refined version of Frank Tolbert. Sullivan will be a slasher in college. Auburn wants him to be a point guard. I haven't seen enough to judge Sullivan's ability to handle point guard in the SEC. Alli Smalley, the women's guard, was a similar high-school player and has struggled to make the transition from HS 2 to SEC 1. Auburn has moved up its spring start date to this Sunday. Friday Feb. 29 - 4 p.m.
Saturday March 1 - 10 a.m.
Sunday March 2 - 4 p.m.
Tuesday March 4 - 7 a.m.
Friday March 7 - 4 p.m.
Saturday March 8 - 10 a.m.
Tuesday March 11 - 7 a.m.
Friday March 14 - 4 p.m.
Sunday March 23 - 5 p.m.
Tuesday March 25 - 7 a.m.
Saturday March 29 - A-Day – 1 p.m. There is some talk going around that DT Tez Doolittle will apply for a sixth season of eligibility. Applying and receiving are two different things. There are two reasons why I don't think Doolittle will gain relief. a.) The NCAA usually grants those exceptions only when a player deals with a recurring injury that compromises multiple seasons ... or some other overwhelmingly adverse situation. I feel for the kid. The NCAA isn't known for sentimentality. 2.) A torn Achilles tendon is a career-threatening injury for a DT, who puts incredible strain on that area every single play. I just don't see how Doolittle is going to be rehabilitated in time for the 2008 season. This is WAY beyond an ACL or MCL tear. I was there when the injury happened. I heard it snap. This wasn't a strain; this was the real deal. He'll be lucky to walk without a limp. Hey everyone. Due to a scheduling error, I will NOT be covering the R.C. Hatch game because it's not until Wednesday. So it goes. When I cover R.C. Hatch tomorrow, I'll be sure to provide my usual array of brilliant insight into top Auburn basketball signee Frank Sullivan. The combo guard has won four state titles so far. He earned legitimate recruiting interest from a whole wad of schools before signing with Auburn last year. Let me get through a few non-Auburn points here. 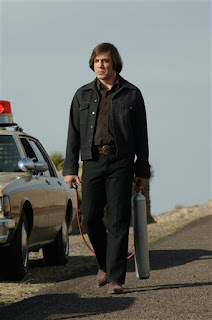 *Today's picture is in honor of Javier Bardem, who portrays ruthless killer Anton Chigurh in the brilliant film "No Country For Old Men." The Oscars are only five days away. I'm certain that the HOTTIES who are Academy voters know the real stuff and will recognize the year's best film appropriately. *In other news, Alabama freshman defensive end Jeremy Elder has been arrested for two counts of armed robbery. That's a Class A felony, that will draw more than a decade of jail time if he's convicted, which led fellow Y Guy (and noted financial magnate) Jeff K. to note: "That's not the kind of stuff law enforcement forgets about." *So I'm at Blockbuster the other day and I want to rent a documentary called "The King of Kong: A Fistful of Quarters." Read the link if you're interested. It won some awards and received three stars from Roger Ebert. I asked Kid Behind The Counter about the movie. Here's how it goes. ME: Do you have The King of Kong? ME: No as in "it's not here right now" or no as in "we never had it?" KID: It's not something we'd carry. KID: It's not mainstream enough. At least he's honest. I went to Best Buy, noted purveyor of non-mainstream material, and picked up the flick for $25. It was a lot of fun. It wasn't that mainstream kind of satisfaction that I'd get from watching Saw 4 from Blockbuster, but it was fulfilling nonetheless. If you'd like to borrow it, we can make that happen. Hey everyone. It's been a crazy 24 hours in the Montgomery area. 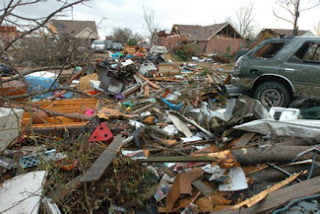 A small tornado levied some big damage in Prattville on Sunday afternoon, decimating an area near the middle of town. You can check out our website for the latest information and reaction from a storm that will be remembered around here for a long time. UPDATE @ 8 p.m.: I talked with former DE Quentin Groves tonight. He's in Atlanta training for the NFL Combine, which begins on Feb. 20 in Indianapolis. Groves' goal is to run a 4.4 in the 40-yard dash. He said the toughest challenge so far has been answering questions from NFL scouts and executives. ``They keep asking me stuff like `Why did you have a bad season?'" Groves said. ``I have to explain the injury. My foot hurt (a lot) every day. It's hard to get a good push that way." The Auburn women beat South Carolina on Sunday to move to 6-4 in Southeastern Conference games. Auburn already has played three of the four teams ahead of it in the standings, so coach Nell Fortner's team has a real shot at the NCAA Tournament. I believe this team would be the SEC's third-best team (behind LSU and Tennessee) if suspended point guard Whitney Boddie was around. She isn't. Still, the team is pretty good as it is. The Auburn men won at Ole Miss on Saturday, moving to 3-7 in league play. C/F/G Quan Prowell scored 25 points. Coach Jeff Lebo today sounded pessimistic about F Korvotney Barber's return schedule. He's been out since December with a broken left wrist. Lebo said Barber has participated in some light drills so far, but isn't yet ready to play. The SEC Tournament is three weeks away. It looks like Auburn's spring practice period will start a few days early. I'm looking forward to seeing the differences between Muschamp's aggressive system and Rhoads' allegedly aggressive system. Pittsburgh, where Rhoads spent the past seven seasons, didn't seem particularly aggressive to me. We'll see. I'm planning to take a look at the players with the most to prove in spring drills. Let's start today with a guy I pegged as a sleeper way back in August. He didn't materialized as I had envisioned. 2008 position on the depth chart: In competition with Jake Ricks, Zach Clayton, Kyle Coulahan and/or Sen'Derrick Marks for a starting spot. The situation: Blanc played remarkably well during the early stages of two-a-days, giving coaches the belief that his outstanding spring wasn't a fluke. Then he injured an ankle. His mobility was compromised for at least two weeks. He eventually split time with Zach Clayton behind Pat Sims during the fall, but wasn't a serious factor on the field at any point. Blanc is a power rusher who still is learning about finesse moves and when to use them. Former DC Will Muschamp encouraged his linemen to be more than straight-ahead guys. It's unclear what Rhoads plans to do in terms of DL technique. Blanc has excellent size and leg drive compared to other players at his position. He lacks Clayton's hands, but provides more power. Those two provide coach Don Dunn with some enticing options.